It’s a cliché, but for good reason. It’s important to come to the weekend with the desire and mindset that you want to meet someone new. Fix this in your mind, send up a prayer and then look for opportunities to connect. Serendipity strikes when we least expect it, but you can be on the lookout. Greenbelt is a great place to challenge yourself, whether it’s preconceived ideas about theology, art or politics. Don’t stick to the same group of people all weekend. Challenge yourself to talk to someone whilst standing in the queue for a talk, the toilets or a food van. Spot someone on their own? Invite them to join you. Remember this year is all about the common good, so keep an eye out for others. Help someone put up their tent. Share your umbrella (or sunscreen!) Offer a spare seat, poncho or cuppa to a neighbour and see where the conversation takes you. 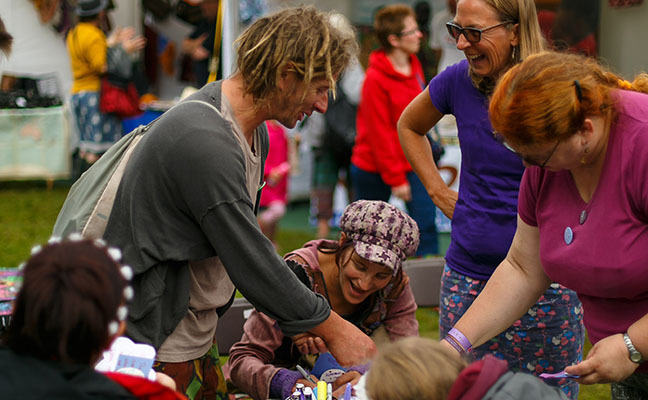 Greenbelt is a fantastic place to open up to new ideas, experiences and people. Join us at one of our social events over the weekend. You can find full details of all our events in the Festival Guide. Look out for our flags and umbrellas on site. ChristianConnection.com is an award-winning dating site, dedicated to matching single Christians in the UK.